In cognitive radio ad hoc networks, the dynamic nature of the radio spectrum calls for the development of novel spectrum-aware routing algorithms. In fact, spectrum occupancy is location-dependent, and therefore in a multi-hop path available spectrum bands may be different at each relay node. Hence, in multi-hop cognitive radio networks controlling the interaction between the routing and the spectrum management functionalities is of fundamental importance. For this reason, a crosslayer opportunistic spectrum access and dynamic routing algorithm for cognitive radio networks is proposed, called ROSA (ROuting and Spectrum Allocation algorithm). Through local control actions, ROSA aims at maximizing the network throughput by performing joint routing, dynamic spectrum allocation, scheduling, and transmit power control. We also propose a new spread-spectrum management paradigm, named ROCH (Routing and cOdedivision CHannelization), in which, unlike mainstream dynamic spectrum access research, digital waveforms are designed to occupy the entire available spectrum, and to adaptively track the interference profile at the receiver to maximize the link capacity while avoiding interference to primary users. Throughput maximization is a key challenge in cognitive radio ad hoc networks, where the availability of local spectrum resources may change from time to time and hop-by-hop. 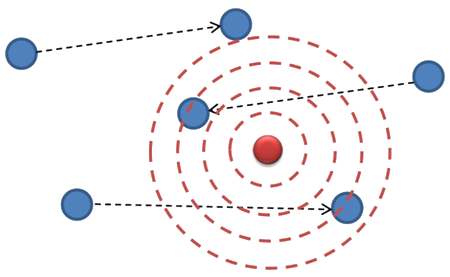 To achieve this objective, cooperative transmission is a promising technique to increase the capacity of relay links by exploiting spatial diversity without multiple antennas at each node. In cooperative communications, in their virtual multiple-input single-output (VMISO) variant, each node is equipped with a single antenna, and relies on the antennas of neighboring devices to achieve spatial diversity. There is a vast and growing literature on information theoretic and communication theory problems in cooperative communications. However, the common theme of most research in this field is to optimize physical layer performance measures (i.e., bit error rate and link outage probability) from a broad system perspective, without considering in much detail how cooperation interacts with higher layers of the protocol stack to improve network performance measures. We investigates the problem of joint routing, relay assignment, and spectrum allocation in a distributed and dynamic environment. Cooperative communication has attracted great attention of research, as it can be employed to achieve spatial diversity without requiring multiple transceiver antennas on the same device. However, the common theme of most research in this field is to optimize physical layer performance, e.g., bit error rate, link outage probability, without considering in much detail how cooperation interacts with higher layers of the protocol stack to improve the network performance measures. We study the cross layer design for video streaming over cooperative wireless multimedia sensor networks. The objective is to maximize the sum peak signal-to-noise ratio (PSNR) of multiple video sessions, by jointly regulating the video encoding rate at application layer, deciding the optimal relay selection strategy and controlling the transmission power for each source and relay node at lower layers. The research concentrates on at least three aspects: 1) Derive the upper bound for sum PSNR and study the interactions among video rate control, power allocation and relay selection. 2) Design distributive algorithms, which are implementable and has performance close to the optimum. 3) Implement and verify the algorithm using hardware, e.g., USRP2. Extension of the research includes incorporating the mobility of nodes and routing, employing the game theory to study the fairness among multiple nodes. 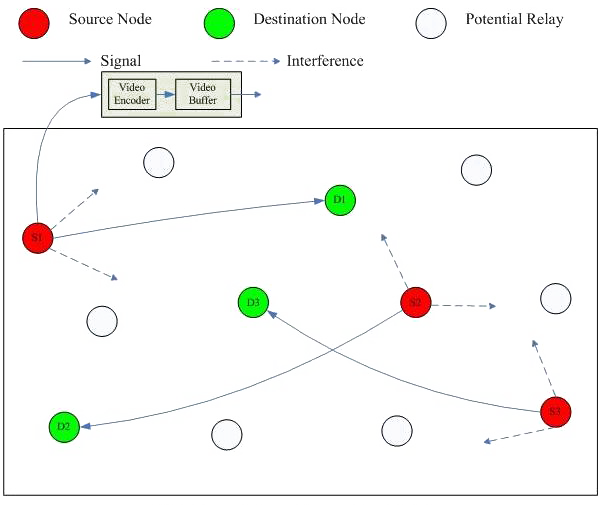 Distributed optimization and game theoretic techniques have been applied extensively to control the behavior of decision makers in networking problems and to characterize interactions among them. Existing game theoretic approaches ignore the queueing dynamics that characterize complex networked systems. In wireless networks with distributed control users typically compete to access the available spectrum. Therefore, each user is a potential interferer for all other nodes, which makes the transmission strategies closely coupled among all users through time-varying, frequency and location-dependent interference. We study distributed queueing games in interference-limited wireless networks. The objective is to maximize the sum throughput of multiple users, through i) modeling the distributed selection of transmission strategies of each user as a queueing game (e.g., Nash Equilibrium â NE problem); ii) developing distributed and semi-distributed algorithms that can achieve different levels of performance based on the level of cooperation allowed among the users; iii) designing globally optimal solution algorithm to derive the global optimum of the centralized version problem of the distributed queueing game and to provide a performance benchmark for any (semi-)distributed algorithms; iv) implementing the proposed distributed algorithms on a USRP2/GNU Radio testbed to evaluate the performance of the proposed algorithms. 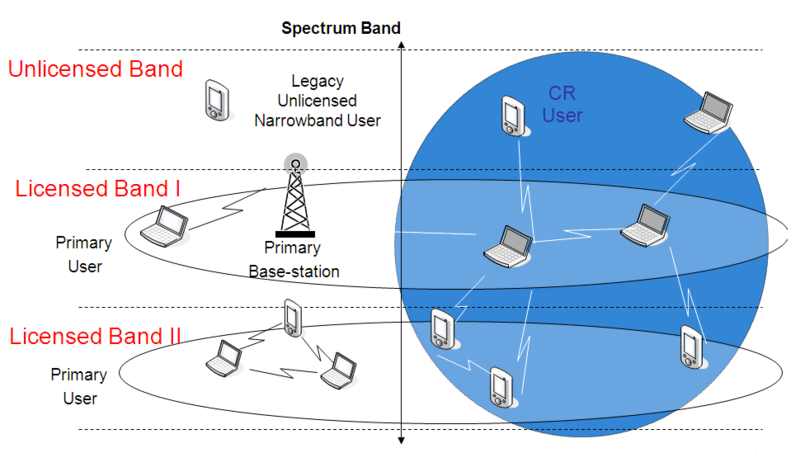 The broadcast nature of the wireless channel makes wirelessly networked systems vulnerable to Denial-of-Service (DoS) attacks. This is particularly true in infrastructure-less wireless networks, where there are generally no centralized coordinators. In such networks, how should legitimate users respond to jamming attacks considering time-varying dynamics such as channel fading and multi-user interference is still an open issue. Since collaboration in infrastructure-less wireless networks is often not practical, non-cooperative game theory becomes the proper tool to model jamming and anti-jamming strategies. We are leveraging advanced game theoretical techniques to study jamming games in heterogeneous scenarios to determine how a legitimate user (or a jammer) should behave to maximize (or minimize, respectively) system performance metrics of interest. It is well-known that wireless networks are vulnerable to various types of attacks on all layers in the protocol stack. This feature implies a sophisticated attacker can utilize a simple attack on one layer to achieve its goal on another. Our objective is to design protocols to ensure high-throughput wireless networking in the presence of heterogeneous cross-layer attacks. We consider potential risks to data security in multi-hop infrastructureless wireless networks where cross-layer routing protocols are used. We show that an adversary, as long as it controls a few of the nodes, and with the help of a few assisting jammers, can extend control over a significant portion of the data in the network even with very simple strategies and limited resources, by creating a so-called “wormhole” even without off-band links. We refer to this jamming-assisted data control threat as hammer and anvil attack. We design a countermeasure to the hammer and anvil attack, by proposing a Bayesian-learning based detection scheme and proposing a method to prevent the suspected node from gaining any information on the data by utilizing secure network coding. Dealing with increasing levels of interference has become a crucial challenge to improve the capacity of wireless networks operating in congested portions of the radio frequency spectrum. 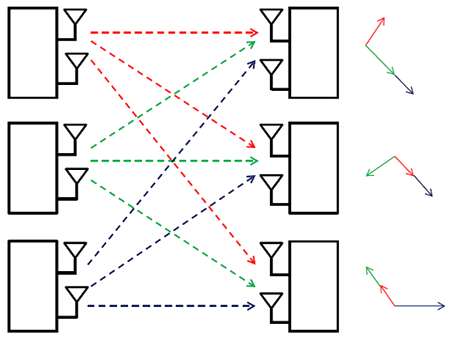 In traditional communication systems, interference is treated as noise, without taking advantage of the spatial diversity offered by multiple-input multiple-output (MIMO) transmission techniques. However, it is known that through recently-proposed interference alignment techniques, every user can in principle achieve up to half of the total capacity, compared to 1/K of the total capacity (for K users) using traditional interference avoidance techniques. 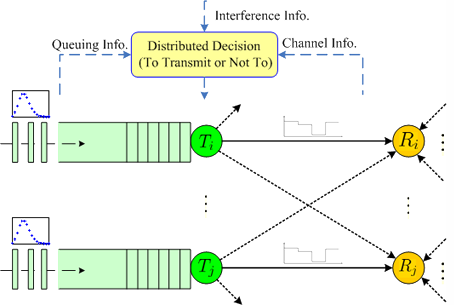 Although interference alignment has a substantial theoretical base, it is not well understood how to design distributed interference alignment schemes for practical multi hop wireless networks. We are developing practical distributed interference alignment schemes based on distributed optimization techniques. L. Zhang, T. Melodia, "Hammer and Anvil: The Threat of a Cross-Layer Jamming-aided Data Control Attack in Multihop Wireless Networks," in Proc. of IEEE Conf. on Communications and Network Security (CNS), Florence, Italy, September 2015. G. Sklivanitis, E. Demirors, A. Gannon, S. N. Batalama, D. A. Pados, T. Melodia, "All- spectrum Cognitive Channelization around Narrowband and Wideband Primary Stations," in Proc. of of IEEE Global Communications Conference (GLOBECOM), San Diego, CA, USA, December 2015. L. Ding, T. Melodia, S. Batalama, J. Matyjas "Distributed Resource Allocation in Cognitive and Cooperative Ad Hoc Networks Through Joint Routing, Relay Selection and Spectrum Allocation," Computer Networks (Elsevier), in press 2015. G. Sklivanitis, E. Demirors, S. N. Batalama, D. A. Pados, T. Melodia,"An All-GNU Radio Transceiver for All-Spectrum Cognitive Channelization," in GNU Radio Conference (GR- Con14), Washington, DC (USA), September 2014. L. Ding, Y. E. Sagduyu, J. Yackoski, B. Azimi-Sadjadi, J. Li, R. Levy, and T. Melodia, "High Fidelity Wireless Network Evaluation for Heterogeneous Cognitive Radio Networks," in Proc. SPIE Defense, Security and Sensing Conference, Baltimore, MD, April 2012. Zhangyu Guan, Lei Ding, Tommaso Melodia, Dongfeng Yuan, "On the Effect of Cooperative Relaying on the Performance of Video Streaming Applications in Cognitive Radio Networks," in Proc. of IEEE Intl. Conf. on Communications (ICC), Kyoto, Japan, June 2011. Zhangyu Guan, Tommaso Melodia, Dongfeng Yuan, "Optimizing Cooperative Video Streaming in Wireless Networks," in Proc. of IEEE Intl. Conf. on Sensor, Mesh and Ad Hoc Communications and Networks (SECON), Salt Like City, Utah, June 2011.